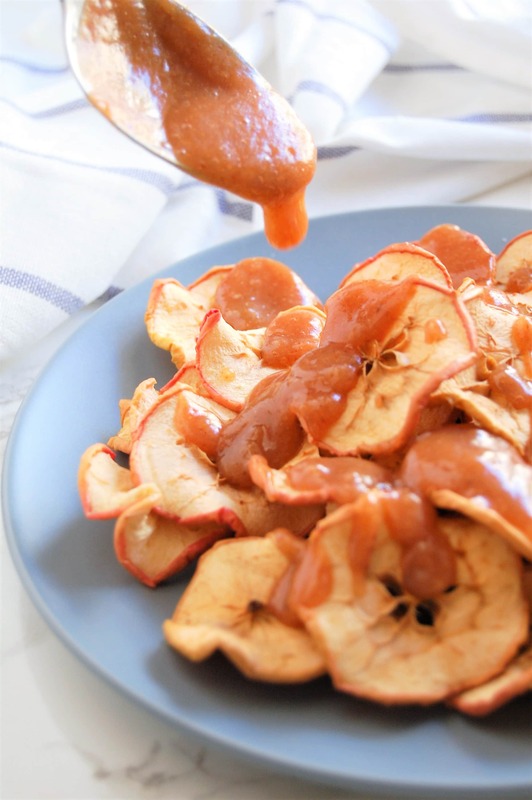 Salted Caramel Honeycrisp Apple Butter tastes like caramel sauce drizzled over apple pie, but it’s totally plant-based and has zero added sugar! Hiiii and get ready for some yummmm! Let me introduce you to Salted Caramel Honeycrisp Apple Butter: aka the apple butter my family is obsessed with. Why so obsessed? It’s made in a slow cooker – easy peasy! There is no added sugar! 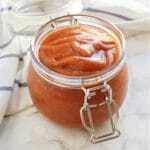 The apple butter is sweetened entirely by apples and nature’s candy: medjool dates! 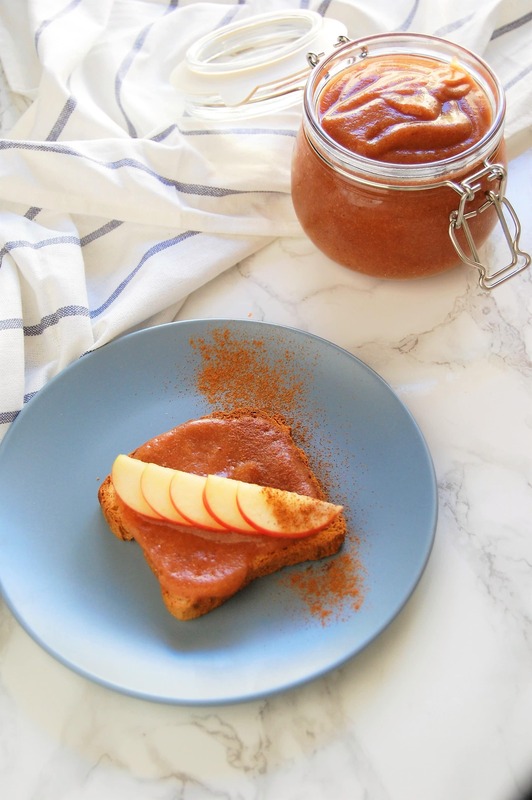 It’s lightly spiced with a touch of cinnamon for a classic apple butter flavor. It’s got a natural caramel flavor from the caramel notes of the dates, the complexity of flavor that develops from cooking low and slow in the slow cooker, and being blended with coconut milk and salt at the end to really capitalize on the caramel notes. Basically, it’s yum. In fact, my husband dubbed this the “apple butter that tastes like caramel drizzled over apple pie”. If you’re a fan, be sure to let us know! Take a pic and share your thoughts with us on the Nutrition to Fit Facebook page, or over on Instagram (be sure to tag me – @nutritiontofit – and use the hashtag #nutritiontofit). 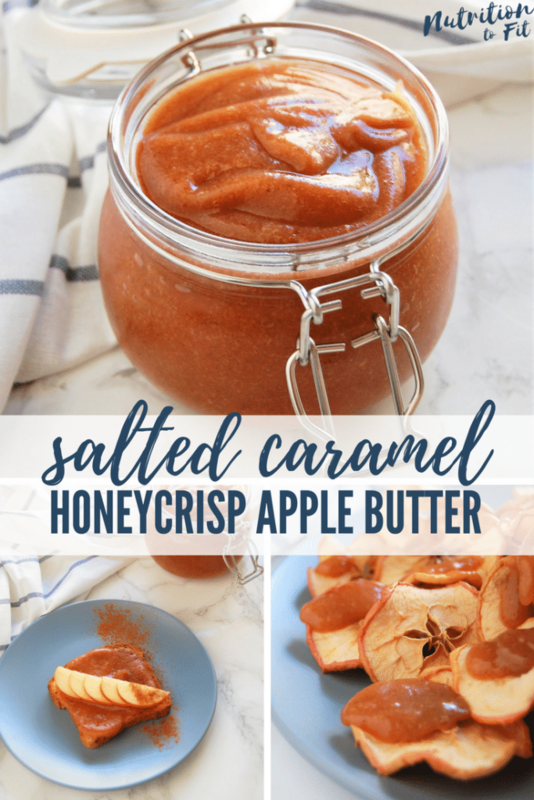 Let me know what creative uses you find for this delicious Salted Caramel Honeycrisp Apple Butter. 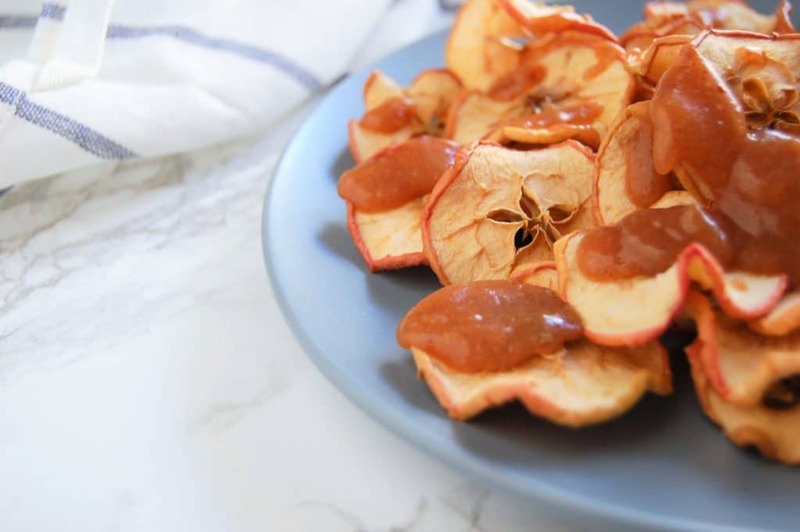 Salted Caramel Honeycrisp Apple Butter tastes like caramel sauce drizzled over apple pie, but it's totally plant-based and has zero added sugar, sweetened entirely from fresh fruit! Combine apples, dates, water, vanilla, and cinnamon in a slow cooker. Cook 3-4 hours on high heat or 6-8 hours on low heat. Carefully transfer slow cooker contents to a blender or use an immersion blender to puree apple mixture until completely smooth. Stir in salt and coconut milk. You can peel the apples if you'd like, but I did not. I have a high-powered Vitamix blender, so the peels blend easily. If you have a weaker blender and struggle to achieve a smooth puree, you may want to peel your apples. I prefer the sweet-tart flavor of honeycrisp, but you can use any type of apple. You can use full fat or lite canned coconut milk for best results. I have not tested it with any other alternatives, but something like almond milk that's a little thinner may not make the apple butter as creamy. The nutrition information has been calculated using full fat canned coconut milk. 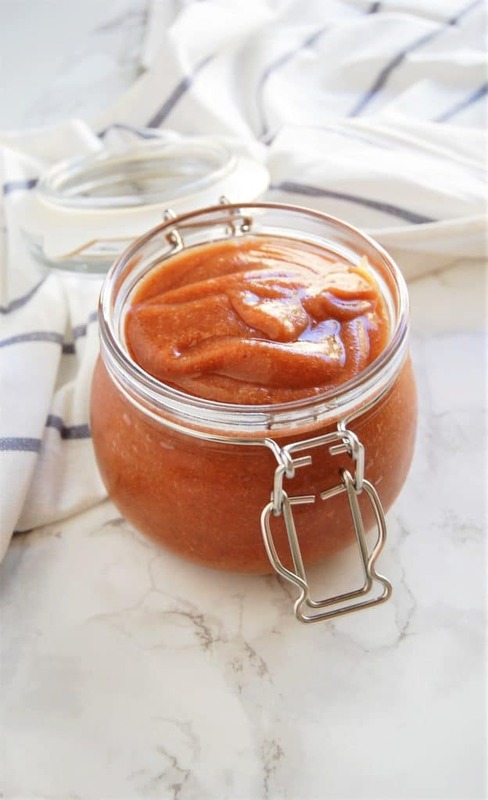 Jaime from moderndayfox.com adapted this for the Instant Pot: soak the dates in hot water for a few minutes, then combine ingredients in the Instant Pot or 20 minutes on High Pressure with a Quick Release. Leftovers can be frozen in airtight freezer-safe storage containers up to 3-4 months. I converted this recipe to the Instant Pot! 20 Minutes High pressure with a quick release. It was PERFECT! I took some to a couple neighbors and they went nuts over it. I posted your recipe in the Instant Pot Community and hope it drives lots of people to your site! Jaime, that is the best comment ever!! You totally made my day! Thank you SO MUCH – I’m going to update the recipe with a note sharing your Instant Pot method! THANK YOU!!! Can’t wait to try this. Thanks for the recipe! thank you so much, Candice, I hope you enjoy it! I loved the flavor the Medjool dates added to this recipe! Yum, so good on my morning toast! Thank you! I basically was in apple heaven after making this! I dipped my apples into the apple butter and it was the most delicious moment of the day! mmm apple heaven!! So glad you enjoyed! I followed the girls instant pot recipe instructions above and this turned out amazing!!! It’s sad to say I am almost 37 and just had apple butter for the first time–now I need to make up for lost time!!!! Yeah you do! There are many ways you can enjoy it! Two words: Game. Changer. I can’t believe how easy it is to eat healthy and not feel like you’re missing out. Such good work on this one! Thank you! Such a delicious recipe, hard to believe there’s no added sugar, right?